These socks are the first thing off the needles in a long, long time. Fall is such a great time to knit, but look, here it is December already! 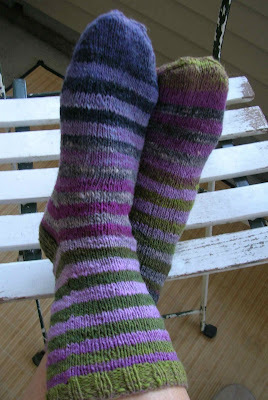 This is the Noro sock yarn. I knit from the same ball, from the inside and the outside, five rows each. I don't know about you, but as soon as a project is finished I loose interest in the item somewhat. Maybe it's from looking at it for so long. I've worn the socks a few times and I'm not sure yet how sturdy they're going to be. I'm a little nervous. Maybe darning will be my next crafty adventure. I had plenty of left over yarn. 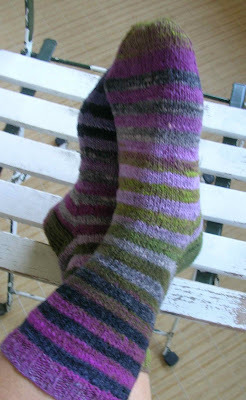 Here's a little Noro mitten. 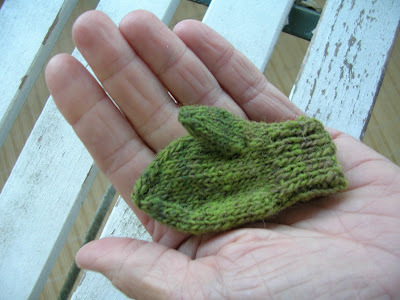 I really want to make mittens next, and thought I ought to make a little practice one, to see were I'm going. Not bad!